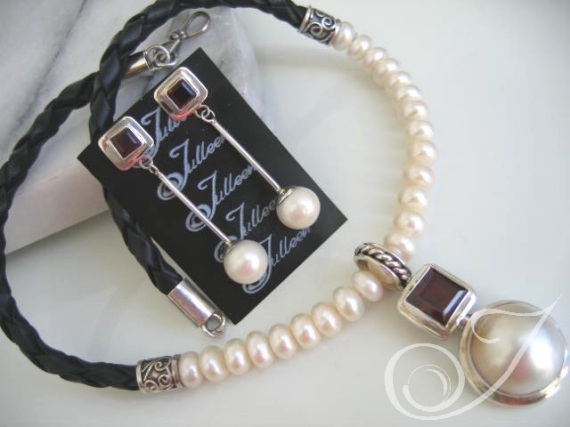 Striking and versatile pearl jewellery set. Blood red 9mm square cut garnet with a lustrous white 15mm mabe, both double bezel set in chunky sterling silver. We made the bail large enough to slide over the 8mm white button pearls and the leather strap and closures. That way it can be worn individually, as a lovely clean style pearl and leather necklace or with the pendant, on a neoprene band or gold or silver chain. For the earrings we decided to set the garnet on the square as it mimics the simple lines of the pendant and of course the large white 11mm round pearl adds even more luxury to this appealing pearl jewellery set. Majorca Red Necklace or Felicia Drop Earrings.